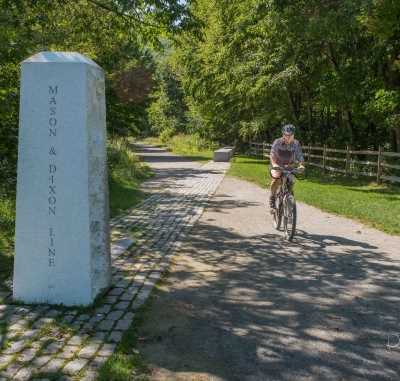 One of the first long-distance rail-trails in the U.S.
Katy Trail State Park is a 237-mile long rail-trail that crosses the state of Missouri. 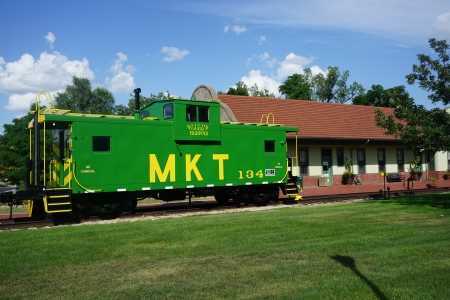 Managed now by Missouri State Parks, the trail is built on the corridor of the former Missouri-Kansas-Texas (MKT) railroad known by its popular nickname – the KATY. The trail mainly follows the Missouri River, which the Lewis and Clark Expedition used on their historic trip to map the West in the 1800s. 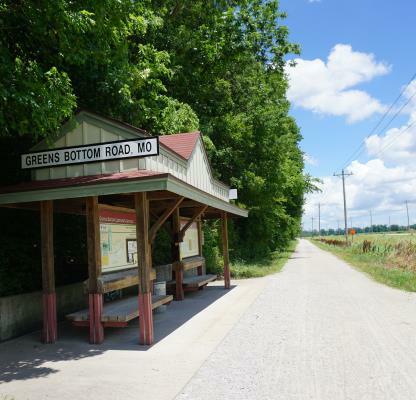 The trail between Booneville and St. Charles is part of the American Discovery Trail, and interpretive signs of that journey are found at many stops along the way. You’ll ride through some of the most scenic parts of the state including forests, valleys, open prairie, pastures, and bluffs. The Katy Trail also crosses diverse habitats and conservation areas, with excellent birdwatching opportunities and plenty of wildlife. Book Now Questions? Contact Us! Meet your shuttle in St. Charles at 8 a.m. for transfer to the western end of the trail – Clinton, Mo. Upon arrival, bike out of town and begin your journey. End the day in the small town of Sedalia. 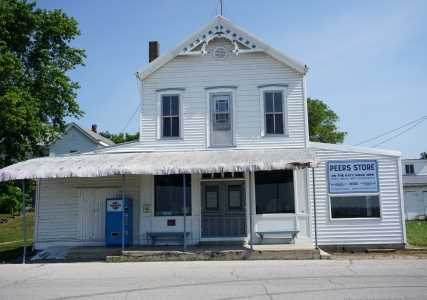 Enjoy breakfast in Sedalia then spend an easy day biking the slight uphill grade to Boonville. Most of the trail is covered in shade and you’ll enjoy biking across truss bridges and past sleepy cows. Arrive early to spend the evening in Boonville, Mo., named after two sons of Daniel Boone who moved here in the early 1800s to found a salt business. Cross the Missouri River out of Boonville and ride toward Rocheport, past the historic starting point of the Sante Fe Trail. From Rocheport to N. Jefferson enjoy perhaps the most scenic section of the Katy Trail. With the bluffs on your left and the Missouri River to your right, you’ll feel like a true explorer as you retrace the footsteps of Lewis and Clark. 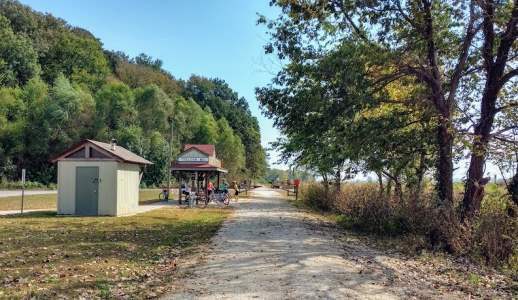 In the afternoon, you’ll leave the trail at N. Jefferson and ride a connector trail (approximately 3 miles) to your B&B in Jefferson City. 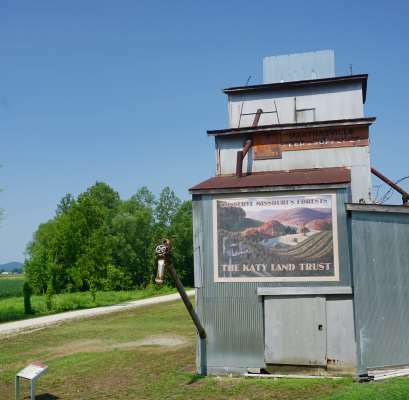 Return to the Katy Trail via the Jefferson City connector trail, then continue through the farms and vinelands Missouri’s Rhineland today. End the day in the historic town of Hermann, famous for its wineries and German history. Take in the open views of central Missouri as you roll past fields and conservation lands. At then end of the day, ride off the trail and up into Augusta, another town popular with wine and food lovers. On your last day biking the Katy Trail, travel through woodlands alongside the Missouri River and back into the populated suburbs surrounding St. Louis. 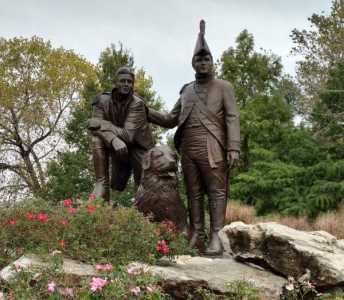 Arriving in St. Charles, end your trip at Frontier Park where statues of Lewis and Clark will greet you. Consider spending the night in St. Charles to enjoy the historic downtown. Hotel nights before and after the trip can be added to your trip. Just ask! Both prices include a one-way shuttle on Day 1. Solo riders and groups of 6 or more – please request a custom itinerary for accurate pricing. This trip includes lodging for 5 nights and 5 breakfasts. Breakfasts are included on most trip days. For the remaining meals, we provide daily suggestions and will consider your dietary requests, making special arrangements as needed. Please be aware that many restaurants are closed at the start of the week (Monday-Wednesday). We will advise you to purchase lunches in advance (the night before) on some days of your trip when we know you’ll be biking through sections that have limited or no food options. Riders with dietary requests including vegetarian, vegan, and gluten-free will find that there are limited options on the trail. Rocheport and Augusta have particularly limited options on some days of the week. Our Katy Trail bike trips utilize the best in local B&Bs and hotels to ensure a comfortable and refreshing stay each night. B&Bs are located next to the trail OR in short biking distance along dedicated bike paths and road shoulders. You will cross the river in Jefferson City and Hermann to reach your accommodations those nights. Overnight stays in St Charles at the start and/or end of your trip can be added. Solo riders can feel safe riding alone on the Katy Trail. If you have a family or friend group, we do our best to offer discounts by utilizing accommodations that allow 3 or 4 guests in a room. Request a custom quote and price here. We do our best to advise of vegetarian and vegan options for dining along both trails. Those with coeliac disease and/or other significant dietary restrictions, please also advise us AT THE START OF YOUR QUOTE PROCESS so that we can discuss your itinerary options. Food is important! Our trail season runs in the spring (late April to mid June) and fall (September and October) as dictated by the weather. Summer months can be extremely hot and the lack of shade on sections of the trail makes travelling then difficult. Spring trips can encounter rain. September and October are the peak months for riding the Katy Trail. The towns of Hermann and Augusta are very popular with wine lovers and have Oktoberfest events almost every weekend in the fall. For those reasons, we recommend booking a fall trip at least 6-9 months in advance, if not earlier, to find accommodations. Our Katy Trail tours will start and end in historic St. Charles, just across the river from St. Louis, Missouri. There are hotels around the St. Charles area, but just one in walking distance of the trailhead. Taxis, shuttles, and Uber options are available for riders without vehicles at that end of the trail. Transportation to/from St Charles and the St Louis airport can be found with taxis and other car services. The western end of the trail between Clinton and Boonville is also a rail bed, but there is a consistent uphill and the crushed gravel can be a little deeper in spots. This is a newer portion of the trail, so not quite a worn in. The Katy Trail between Rocheport and St Charles is a flat rail-trail with a crushed gravel surface. St. Charles is a historic town located just across the river from St Louis. The most scenic portions of the trail are around Rocheport and then run up to St. Charles. You’ll follow the Missouri River from Boonville eastward; you are in woods/fields on the western end. A portion of the trail between N Jefferson and Augusta is fairly open in places and travels alongside fields. Those with several allergies to soy or other crops may find this section difficult. It is also more open to the sun and can be very hot in summer. The Katy Trail does not see as much bike traffic as the Great Allegheny Passage, and has fewer trail towns along the way. The trail is well-maintained by the Missouri parks department and has bathrooms and water along the way. Food is more scarce and we will advise riders when to pack food along. Bike rentals can be included for $120/bike (hybrid) plus $20 for panniers. Bikes will be picked up with your shuttle on Day 1 and can be dropped off for no fee in St Charles at the end of your trip. E-bikes are not currently available for this trip. If you can box and rebuild your bike on your own, and if you have good bike cases for shipping, BikeFlights or another shipping method can be much cheaper than renting a bike. If you need help boxing and rebuilding a shipped bike, we can direct you to bike shops along the trails which can assist you for a fee (usually $40-75/bikes). A one-way shuttle between St Charles and Clinton is included in ALL trip prices. If you will be starting on your own in Clinton or Sedalia, we can eliminate the cost of this shuttle. Daily luggage shuttling is offered on this trip. Luggage must be ready each day by 9 a.m. and is transferred to your next overnight location by 4 p.m. We request each rider bring one carry-on sized piece (approximately) and one smaller, personal bag. The Schoolhouse and Lindenhof B&B were spectacular. The beds in all the hotels were really, really comfy. We loved the small towns along the trail and the downhill direction of the trail. We met lovely people everywhere….midwest hospitality and friendliness. There were plenty of little towns along the way. And there were many really, really friendly bikers who were very helpful and fun. Was the trip paced to your satisfaction? Yes, very much so. The Country Inn staff did everything they could to help us…The Hotel Bothwell and Hotel Frederick were both very accommodating and friendly….Capt Wohlt Inn, in Hermann, had Brant going out of his way to help us. He even cleaned our bikes for us. …It was fine for us older folks ( we’re 71 & 72) with no shuttle taking our luggage. Each day was very doable. Of course we had almost perfect weather. We had no issues with food our water etc. thanks to your materials. And, of course, you can’t do anything about the Missouri wind and dust. … the Schoolhouse which was great. Beautiful room, food was great, and the town was fun. We ate dinner at a restaurant that has a special for locals every Wednesday, and it was like being newcomers being welcomed to a new town….Hermann was great. It was good to have an extra day there. One to recover a little, but also nice to have the day to visit wineries and the town. Captain [Wohlt] was great, with fresh water and giant cookies waiting for us. Augusta, Larry thinks was the best b&b on both this trip and the GAP trip last year.